A National Historic Landmark Worlds Oldest Roller Coaster!! 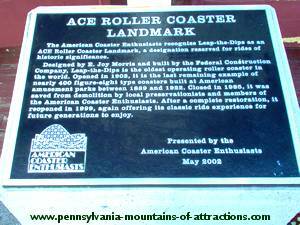 A PA Landmark You Can Ride! "The Worlds Oldest Roller Coaster" at Lakemont Park. 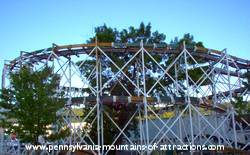 It is actually a Pennsylvania Historical Landmark you can ride!Altoona, PA is home to this unique PA Amusement Park. E. Joy Morris Company built the, Leap-The-Dips, at the park in 1902. It is the only side friction roller coaster left in the United State. In 1996 Lakemont's Leap-The-Dips was awarded a plaque and named a National Historic Landmark. 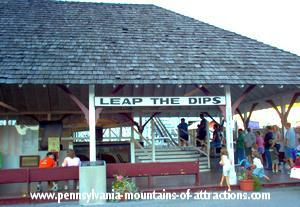 After standing idle for 14 years, Lakemont's Leap-The-Dips, was finally restored and reopened on Memorial Day, 1999. The wooden tracks with wooden trough keeps the ride smooth and a lot quieter than most roller coasters built today. A side-friction roller coaster isn't bolted to its tracks with underwheels. That is what makes the ride much smoother and quieter. There's an interesting history behind getting this Altoona, PA Landmark back together again. You can read about it when you visit Lakemont Parks history. Do you know Lakemont Park is the 8th oldest PA Amusement Park in the World? They just don't make Amusement Park Rides like this Pennsylvania Historical Landmark anymore. The Worlds Oldest Roller Coaster is actually a comfortable ride to sit in. The cars glide along the wooden figure-eight shaped tracks. There are times you feel like you are floating on air. You wouldn't call the Leap-The-Dips an Amusement Park Thrill-Ride but it's really worth taking a trip to Altoona, PA and experience a ride on a Pennsylvania Historical Landmark, let alone The Worlds Oldest Roller Coaster? Why not plan to visit Lakemont Park, Altoona PA, on a Thursday evening and take part in their Hot Wings Contest and Jazz Concert! While you're in the area visit other Pennsylvania Amusement Parks, each with it's own Pennsylvania History, Annual Events, and Family Entertainment. Also located in Altoona, PA is the Wall That Heals. Take the time to show your respect and honor our Veterans. You can read about the Viet Nam War Memorial if you click on PA Memorials button on your left.